We have learned to touch the DOM as little as possible for performance sakes. Batch up changes, and do one call to innerHTML say. Talk over the evil boundary of the DOM as infrequently as possible. Yes, I suppose it should be said: it is established that working with a reference is more efficient than walking an object chain when access is repeated. Hopefully this will save others time doing similar research for particular objects that exist now, or will exist in the future. What is cf. update? I ran your test without reassign back and I got similar results, but they were consistently different. Whats reassigning back doing that a shared reference would not? i want to second that my superfluous impression is that the perceived performance gain is due to reduced number of name resolution calls and has per se nothing to do with canvas. it is actually an important and very general technique that works across languages. It’s my experience that some browsers waited till completion of a loop before actually making changes in bulk. I did a line drawing script back in ’98 with some loops and table cell background toggling (don’t look at me like that, I was just starting out). Some browsers would wait till my loops finished then flip all the backgrounds at once, others would draw as the loops worked. Had I known then what I know now I would have done the work first and display when done to get the benefits across all browsers. Reminds me of the good old Java days. Filling a pixel buffer and repainting the applet. :) Maybe it’s time to brush off those old demo effect and put them back into canvas. @atomictim In the beginning of the article I say exactly what you say: the array is a reference and doesn’t need to be copied back. In my tests the results are the same without this line but I will make a real benchmark an update you with the results. @loveencounterflow In my experience you do need to explicitly call the putImageData() function but maybe the behavior vary from one browser to the other. 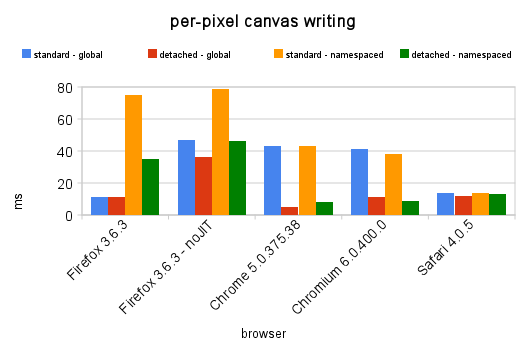 I haven't looked into canvas but I'd also be interested to see if you can access it with 32bit ints rather than as bytes to write single ARGB ints rather than separately.